Is it ‘fair’ trade? Does it support human rights, uphold climate change agreements, encourage high environmental and social standards? Are our own and other countries’ public services protected? Are corporations held to account? And are UK trade deal negotiations democratic? After Brexit, will new trade deals be democratically debated and scrutinised? Will the public have a say in what’s included? Will politicians and the public be able to reject a deal they don’t like? At the moment, the answer to too many of these questions, is NO. But it should, and could, be YES. 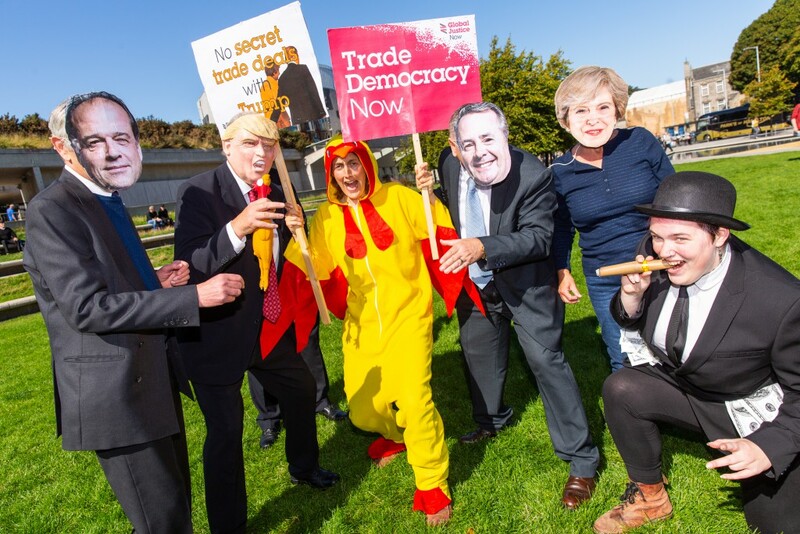 After the vote for Brexit, the Trade Justice Scotland coalition is concerned about new trade deals the UK government might negotiate with the US and other countries. We fear these deals could be worse than TTIP or CETA. Already talks with the US on a future trade deal are being held in secret. But we also know that this time of change offers some opportunities. We could rewrite the rules on trade: to make our trade with other countries ethical and fair; to protect public services in our own and other countries; to uphold international agreements on climate change, human rights and worker’s rights; to ensure that corporations are held to account. We could also make sure that future trade negotiations with other trading partners across the world are transparent and are thoroughly scrutinised by MPs. Last November, the UK government published a new trade bill. The bill sets out a legal framework for trade deals after Brexit. But the bill contains none of our vision for a just and democratic UK trade policy. Infact, the bill ensures the opposite: that any future UK government could go ahead and agree some really toxic trade deals without any scrutiny or debate of these deals by either the House of Commons at Westminster, or our devolved parliament at Holyrood. When the bill was debated at Westminster, Green MP Caroline Lucas put forward an amendment that would have allowed in some democratic process into the new trade framework. Unfortunately, it was voted down. Now the bill has gone to the House of Lords but we still have a chance to amend the bill. Please share both petitions widely on social media! The Scottish parliament can choose to withhold their consent to the trade bill. The finance and constitution committee is currently conducting an inquiry into the bill. Unless the bill is amended to allow Scotland to have its say, we believe that Holyrood should withhold its consent. The Scottish parliament recently held a debate about what role Scotland should play in future trade deal negotiations after Brexit. Watch it here. 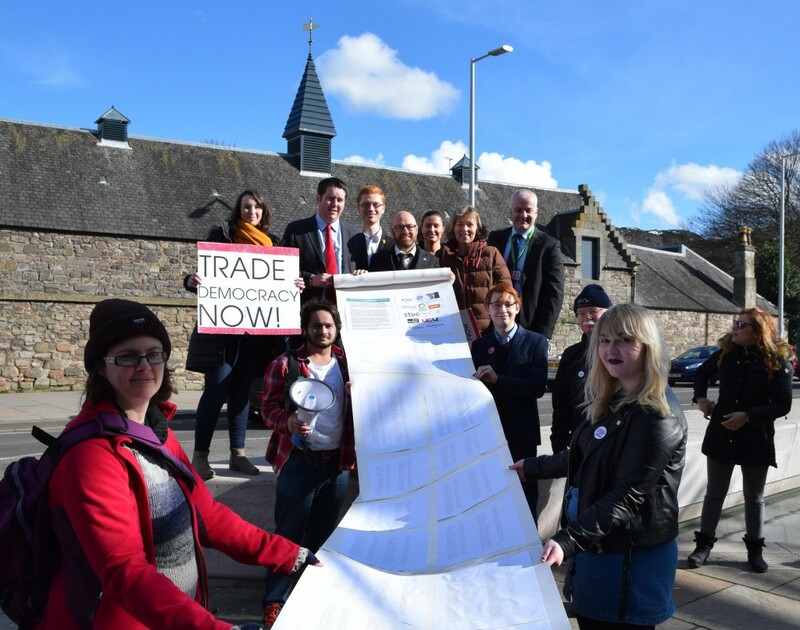 Members of the Trade Justice Scotland coalition gave evidence as part of the inquiry into the trade bill. We expect a final report to be published soon. 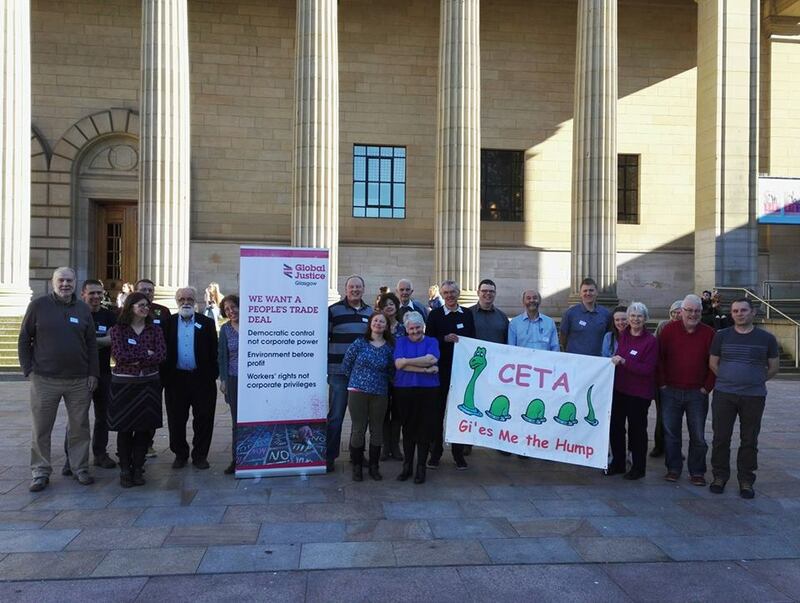 Photo: Members of the Trade Justice Scotland coalition meeting to discuss what a just trade policy might look like. We are calling on Scottish politicians to sign up to them. Please contact MPs and MSPs to ask them to sign up to our principles!